Here are some suggestions of things to do during the weekend in Borderstan, really close by or in the city. Florida Avenue Grill is perfect for a weekend breakfast with wonderful home-style food at a very good price. At the corner of 11th Street and Florida Avenue NW, it has been a fixture in the area for years. Lauriol Plaza at 1835 18th Street NW is probably one of the best places in town to enjoy Latin American food. Get there early for brunch, lunch or dinner; good prices for the food and service, but it is usually crowded. “Good People, Bad Behavior” is at G Fine Art Gallery, 1515 14th Street NW with works by Tim Bearse, Christiana Caro, Nicholas des Cognets, Benjamin Jurgensen, Ian McMahon, Nataliya Slinko, Hannah Walsh. “Line Forms Here” is showing at plan b gallery in Borderstan, 1530 14th Street NW. 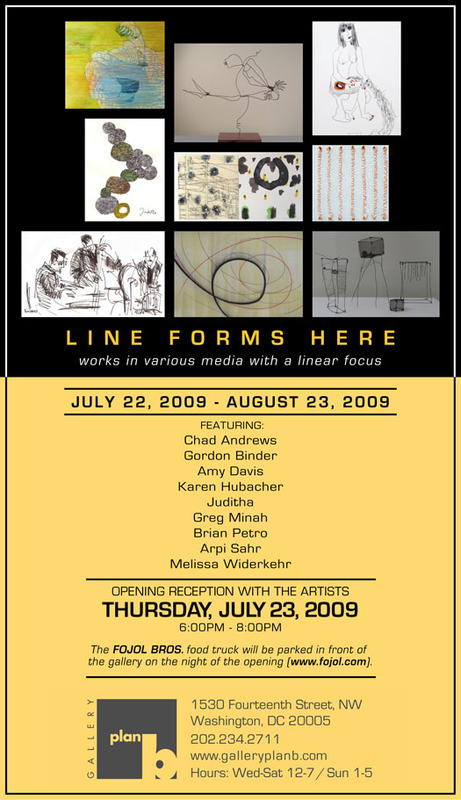 This is a new show: “Line Forms Here – Works in various media with a linear focus,” by Chad Andrews… Amy Davis… Karen Hubacher… Juditha… Arpi Sahr… Melissa Widerkehr… Brian Petro… Greg Minah and Gordon Binder. It opened July 23 and runs through August 23. Paul McCartney is at FedEx Field on Saturday August 1 at 7:30 p.m. in Landover, Maryland. Come out this weekend and celebrate life in Borderstan with two area events. Enjoy food, shopping and great people watching this weekend on 14th Street NW and U Street NW. First is the “U Street Community Festival.” The U Street Neighborhood Association hosts a community festival this Saturday, August 1 from 10 a.m. to 3 p.m. at the Reeves Municipal Center, 14th and U Streets NW. The event is in conjunction with the 10th Annual MidCity Dog Days of August Sidewalk Sale weekend and the weekly Farmers Market (9 a.m. to 1 p.m., Saturdays only). 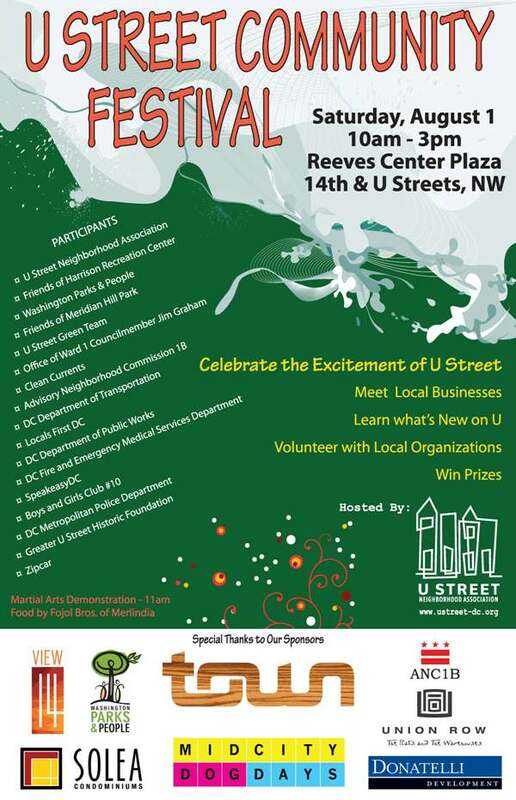 The U Street Neighborhood Association will host a community festival this Saturday, August 1, 10 a.m. to 3 p.m. at the Reeves Municipal Center, 14th and U Streets NW. The event is in conjunction with the 10th Annual MidCity Dog Days of August Sidewalk Sale weekend and the weekly Farmers Market (9 a.m. to 1 p.m., Saturdays only). MPD Lt. Scott Dignan has returned to head Police Service Area 208, which covers the Dupont Circle area and part of Kalorama. He was head of PSA 208 before Lt. Erich Miller, who left MPD in mid-June for a job with the federal government. Sgt. John McDonald, who served as Acting PSA Commander since mid-June, will remain in PSA 208. 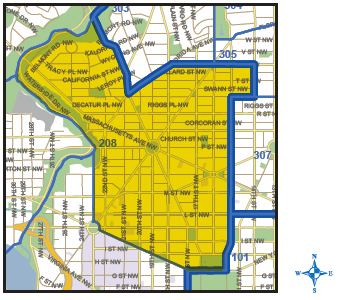 West Borderstan (west of 15th Street NW) is in PSA 208. No Fear: Car Break-In on Corcoran, 9:30 A.M. This guy was photographed breaking into a car at 9:30 a.m. today on the 1500-block of Corcoran Street NW. His bicycle is visible in the bottom of the photo. After jacking the car, he rode off on his bike. Note: Luis reported this incident at One Photograph A Day and gave me the information. 1500-block of Corcoran Street NW, 9:30 a.m.: This photo shows a break in and theft from an auto in progress. Our neighbor on the block looked out his window, saw what was happening and called the police. According to our witness (who has talked to the police), the guy pulled up on his bike, which he then parked on the sidewalk (in the bottom of the photo). He apparently saw something on the back seat of the car, then smashed the right back window and then popped the trunk. According to the witness, the guy did not seem to have a care in the world… didn’t seem to be worried about being seen or caught. 14th St NW: What Do You Want More Of? What kind of stores and businesses do you want more of on the 14th Street NW corridor… between Thomas Circle and Florida Avenue NW? You can pick as many as you want. The local rooftop burglar–or at least a rooftop burglar–made another attempt early on Friday, July 24 at 1:30 a.m. in Borderstan. However, he was foiled when the resident of the house in the 1500-block of Church Street NW heard him and scared him away. Additional crimes from the past several days in the area are below. Notable crimes include robberies, assaults, burglaries and stolen autos. Put ’em down on your calendar… always good fun in Borderstan. The 10th annual MidCity Dog Days Sidewalk sale is next weekend, August 1 & 2. August 1st and 2nd mark the tenth annual Dog Days of August sidewalk sale along and adjacent to the 14th and U Street corridors. MidCity shops, galleries and restaurants will take their wares to the sidewalk, feature performers and special events and welcome shoppers to one of DC’s most unique and dynamic retail zones. Food News: Good Cheap Eats Coming to 14th Street? “Devilish Burgers Headed to 14th Street.” Hot on the heels of the recent announcement of the forthcoming bakery and wine bar next to Marvin (“I’ll have a loaf of cinnamon bread and a glass of your 2003 Malbec please”), 14thandyou has received this nugget of info: the space down adjacent to the bake-oenology place, located at 2001 14th Street, will in fact be a “top-shelf” burger joint owned by Policy’s Omar Miskinyar and David Karim, and featuring creations from Policy chef Brian Murphy. Read posting. “More Info on “Table 14”; “World’s Best Philly Cheese Steak” Coming to 14th Street.” Metrocurean has an update today on the forthcoming establishment on 14th Street from the Local 16 guys… In other news, a quick peak inside the former 14U coffee shop seems to show renovations moving forward for the soon-to-arrive “JJs: World’s Best Philly Cheese Steaks“. Read posting. A new show, “Line Forms Here – Works in various media with a linear focus,” opened Thursday evening at gallery plan b in Borderstan. The show runs through August 23 at the gallery, located at 1530 14th Street NW. Gallery owner Paula is featuring works by Chad Andrews… Amy Davis… Karen Hubacher… Juditha… Arpi Sahr… Melissa Widerkehr… Brian Petro… Greg Minah and Gordon Binder. Go to the gallery Web site for links to each artist. Hours at gallery plan b are Wednesday through Saturday, noon to 7 p.m., and Sundays from 1 to 5 p.m., or by appointment. RedRocks Pizzeria is at 1036 Park Road NW in Columbia Heights. Thai Tanic is in Borderstan at 1326 14th Street NW. RedRocks Firebrick Pizzeria at 1036 Park Road NW opened in 2007 and has some of the finest pizzas in the city (in my opinion). It has a patio and makes for a smart choice for a quick good meal. Thai Tanic Restaurant is one of the pioneers business in the area, located at 1326 14th Street NW. It is also a favorite of ours with an extensive menu and affordable prices. Capital Fringe Festival: “Revolutionary! 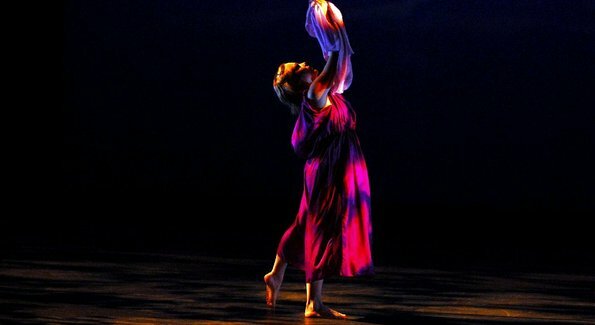 Isadora Duncan,” is showing at the Mount Vernon Place United Methodist Church, 900 Massachusetts Avenue NW. Showtime is this Saturday at 11:30 a.m.
“Storefront Churches: Photographs by Camilo José Vergara,” is at the National Building Museum at 401 F Street NW. 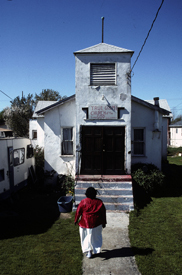 Vergara says, “I quickly understood churches to be crucial to my project, and a separate study of them began to develop.” The exhibit includes areas of Chicago, Detroit, Los Angeles and New York. “King Lear” plays downtown at the Sidney Harman Hall. The Bannaba Project performs at the National Museum of the American Indian on The National Mall. 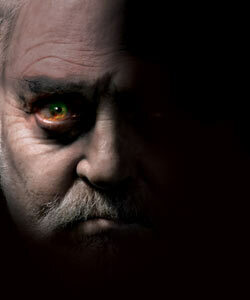 William Shakespeare’s “King Lear” is at the Sidney Harman Hall, 450 7th Street NW. A production of the Shakespeare Theatre Company, “King Lear” is both an “intimate family drama and an explosive political epic”. 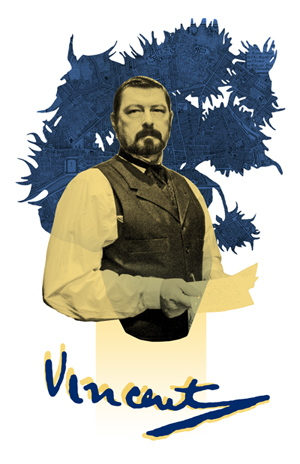 “Vincent” by Leonard Nimoy is playing at the DC Arts Center. The Bob Dylan Show, John Mellencamp, and Willie Nelson and Family are at Ripken Stadium. “Vincent,” written by Leonard Nimoy: “The show offers an evening of laughter, tears and insight into van Gogh’s passion and suffering, while considering the meaning of art and artistry in a world where success is judged in terms of sales, by which measure van Gogh fell short during his lifetime.” It is at the DC Arts Center, 2438 18th Street NW. 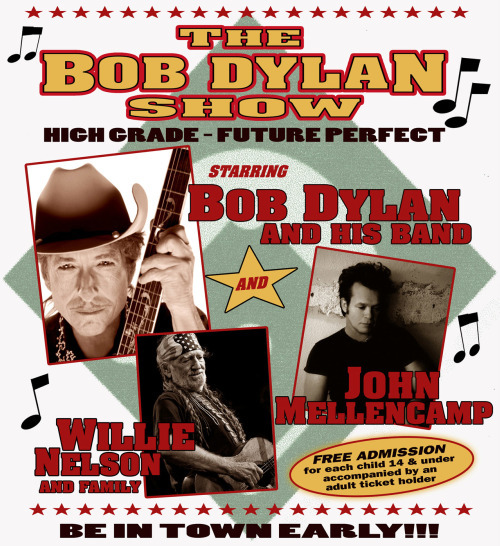 Bob Dylan & His Band, John Mellencamp, and Willie Nelson and Family are playing at Ripken Stadium at 873 Long Drive in Aberdeen, Maryland, on Friday, July 24. I think this DC Police Alert from this afternoon almost leaves me speechless. An armed gunman committed a robbery this afternoon at 1:43 p.m. at 16th & K NW, which is exactly 0.4 miles north of The White House. Questions for the DC City Council: My family visits next month from Illinois. If they ask me, “Is downtown DC safe?” what would you like me to tell them? Should I say, “Don’t go near The White House in broad daylight, you might get robbed by an armed gunman”? Here are recent crimes of note in Police Service Areas (PSAs) 208 and 307 from Friday to Monday. Crimes of note are stolen autos, burglaries and violent crimes such as robberies and assaults. West Borderstan (west of 15th NW) is part of PSA 208 while East Borderstan (east of 15th NW) is part of PSA 307. In general, PSA 208 covers the Dupont Circle neighborhood while PSA 307 covers Logan Circle and a bit of Shaw. July 17, 6:20 p.m. Robbery (Other Armed), 13th Street NW & Massachusetts Avenue NW – Street/Highway/Road. July 19, 4:11 a.m., Robbery Force and Violence, corner of New Hampshire Avenue & Swann Street NW. LOF B/M wearing red and white rugby shirt with gold writing on the right side American League and jeans with other suspects no description. Event #I20090393872. July 19, 1:36 a.m. Attempted Robbery, 1300 block of Florida Avenue NW. LOF 3 B/Ms in a red Jeep Cherokee with Illinois tags–Similar LOF Robbery with Gun in PSA 305. Event #I20090393637. July 19, 1:37 a.m. Robbery with Gun, 15th & Florida Avenue NW. LOF 2 B/Ms in a red vehicle. Event #I20090393640. July 20, 9:15 a.m. Burglary, 1700 block of S Street NW – Residence/Home. July 20, 1:18 a.m. Robbery Force & Violence, 17th & Corcoran Street. NW_LOF B/M 6’02” wearing blue jeans and a white tank top. Event #I20090395451. The monthly Police Service Area (PSA) 208 meeting is tonight at 7 p.m. at Omega Bar (not at 3D police headquarters on V Street NW). Even if you live in East Borderstan (east of 15th) and are part of PSA 307, you are still very welcome to attend. A number of new officers are being assigned to West Borderstan/PSA 208. Officers Smith, Schwartze and Hansohn have been reassigned. On Tuesday July 21st, the Dupont/Kalorama Public Safety/PSA 208 Meeting will meet from 7 to 8:00pm at MPD Omega (big brick building in the alley between P, O, 21st and 22nd, probably upstairs, ask the staff for the police meeting room [it is probably upstairs]. Please spread the word to people who live and work in that area. We’ve been trying to vary the location of the Dupont/Kalorama Public Safety Meeting every other month. Please come up with a location for the September meeting (always the 3rd Tuesday of the month, otherwise at 1620 V Street NW) if you have some issues in a particular area. Good news… I got emails this morning as well as this comment on an earlier posting about Molly the Stolen Dog (below). As best I can tell, Molly was found in DC’s Cleveland Park neighborhood. She was taken from in front of the Whole Foods on the 1400-block of P Street NW on June 29. Hi all, I just wanted to let you know that Molly was returned safe and sound by MPD officers last night! Many, many thanks for posting this here and to everyone for keeping an eye out and hoping for her safe return. This happy ending is most certainly thanks to such impressive efforts to get the word out! There is an ongoing criminal investigation, so unfortunately I’m unable to provide details as to how the police located Molly and the woman who took her. A little Monday-morning dog blogging for you. We took Lupe to Quiet Waters Park in Annapolis on Saturday afternoon… a beautiful and well-maintained Anne Arundel County park. 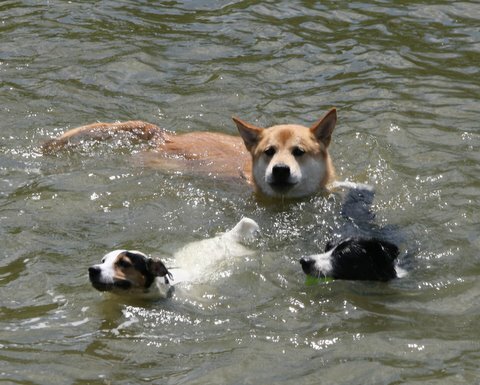 There is an special beach and swimming area for dogs on the South River. Enjoy the slide show of Lupe and other dogs at the beach, courtesy of Luis at his blog, One Photograph A Day.